The New Ronan is a direct inspiration from our recently released Selkie design. When we came out with the Selkie we knew her sweeping lines would draw admiring stares, and we predicted petite paddlers would love that they finally had a boat designed specifically for them. What we didn’t anticipate were the many paddlers who would stare enviously at this low-volume beauty before trying to cram their long legs and large feet into her snug fitting front deck. For these paddlers we’ve created the Ronan, a slightly larger version of the Selkie. Playful and Lightweight: The Ronan is a more spacious version of the Selkie, which is a lightweight, hard-chined marriage of two of our most popular boats (the Arctic Tern 14 and the Murrelet). While 3″ longer than the Arctic Tern 14, the underwater hull is identical, giving it the same efficiency in cruising due to low wetted surface area. 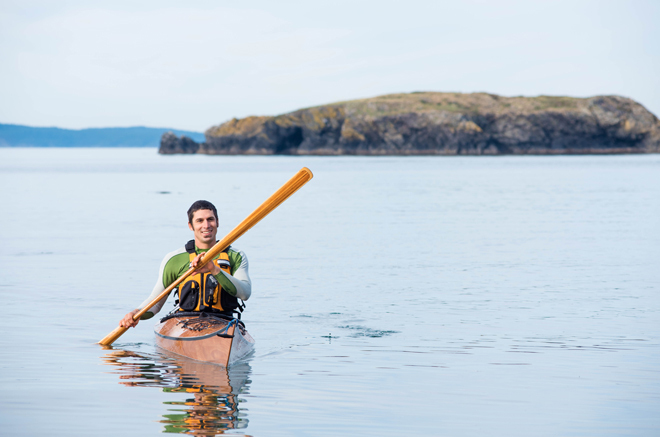 Like the Selkie, the Ronan features a low sheer line with cutaway side deck panels that allow more body rotation and a more efficient use of a Greenland paddle. The major difference between it and the Selkie is its higher hull sheer height and larger cockpit, which allow larger paddlers the space needed for ease of entry and exit. The Ronan’s front cockpit height is 11.5″ while the Selkie is 9.75″. The rear cockpit height on the Ronan comes in at 7.25″ while the Selkie sits at 6.21″. Its dramatically low rear cockpit height makes layback rolls effortless. This kayak is designed for playful paddling in rough water. Experienced paddlers will love this low volume beauty in dynamic water, surf or as a lightweight day paddler. True to Name: Selkies are mythological creatures in Irish and Scottish folklore said to live as seals in the sea but shed their skin to become human on land. Ronan is an Irish language male given name meaning “little seal”, so it seemed an appropriate name for the Selkie’s big brother.